based on several posts on Facebook to my Wall. First, this subject matter does not lend itself to a sound-byte. That’s why science is often wrongly interpreted as unable to respond to wild claims from believers in the supernatural. Complicated things require complicated explanations. Second, this content is not directed at you, CMorte, exclusively. I will be speaking both toward your comments, and toward the spiritual community at large. Third, yes I was a little harsh. I will try to keep my anger at bay long enough to explain why I react that way….this is where Political Correctness and progress intersect (if not with a simple fender-bender, then certainly with an eardrum-splitting crash). Political Correctness has discouraged us, as a society, from speaking the truth, for fear it might damage someone’s fragile sensibilities. Progress should never be impeded by a need to coddle adults who respond to the world as children. This leads to other things, the least of which is redefining the meaning of words, so that no one can communicate clearly anymore. I am working on my own book as well, (Supernatural Hypocrisy: The Cognitive Dissonance of a God Cosmology) and the more I have researched and learned THE FACTS, the more I have moved toward a certain intensity about how damaging and ridiculous this subject is. So yes, I get intense, because this type of worldview has caused and is causing great suffering and peril and death to us all. It’s causing a great number of otherwise intelligent people to cling to a collection of atavistic concepts that have not, and never will serve humanity in any ultimately beneficial way. Any benefits that spirituality ostensibly provides to its adherents, can be found equally in the worldview of philosophy and ethics, communities of other kinds, and so on. It’s a myth that the only morality, hope, purpose and comfort to be found, resides only in the supernatural. And this supernatural belief paradigm endangers ME and those I love, and humanity in general. So yes, I take it personally, though not so long ago, I didn’t. I thought “live and let live”–as long as it didn’t infringe on my pursuit of happiness or my rights or my freedoms or my safety. Now, I take it personally, because it has been personalized and all those privately individual aspects are under siege. Now it DOES infringe on my pursuit of happiness, my freedoms and rights, and my safety. Now, we are seeing the results of people believing in the supernatural, and WANTING or NEEDING to believe in it, coupled with a technological society that allows them to act on it in a global way. It leads to the corruption of scientific principals, the twisting of facts to suit a more comfortable set of ideas in the believer. And that affects us ALL. But I guess Christians are the only ones allowed righteous anger; because they are the bedrock of belief in this country. All other beliefs seem to just spring from there. How often in the last decade, have Christians backed off the dogma and simply adopted the tenets that they liked best, dropping the rest? How often do we hear “I’m spiritual, but not religious”? This indicates not only that morality and goodness is inherent in people regardless of the presence of religion, but also the often lethargic evolution of a realization; a concept no longer making sense. It’s a rare individual who denies a prevailing and sanctioned lie with the severity of a guillotine. Mostly, the denial comes in incremental steps away from the doctrine, when a human brain is niggled constantly by cognitive dissonance. Thus, “spirituality” is one of those steps. It’s still a belief in supernatural, just without the main supernatural component of a supreme deity at the helm. Yes i do have a strong mind. Not the point here. I asked for proof. You don’t seem to have any. You just have assertions. If you’re referring to Dr. David Bohm, the physicist–he interpreted quantum mechanics in his own way, but his theory of holographic universe was overall rejected, since his premises required connections that are subliminal and which violate the principles of special relativity. There is no real evidence of his theory, nor of the subquantum forces he includes in his postulate. If there ever is any evidence to support his claims, then science will find it, test it and it will then be accepted if proven to a high degree of certainty. Until then, it is not to be considered “proof” in the true definition of the word. But notice that Bohm was well known to be gullible and to entertain esoteric ideas with no basis in fact. Bohm carried a key around with him he believed Uri Geller bent, as if it were a holy relic. We now know exactly how this key-bending was done. Michael Shermer even demonstrated it on a video. So while Bohm might have been a brilliant mind, it didn’t preclude him having some erroneous, illogical, and delusional ideas about other things, which again, were never proven to have any veracity whatsoever. There are many things that haven’t yet been explained by science, but they do not fall into the category of paranormal. Also, to say “anything our minds have created” is to give the subject a wide field. There are also many things our minds create that aren’t explained fully, yet don’t require medication. This type of vagueness is also a component of the communication problem between rationalists and spiritualists. Why do you “like to lend credit to the believers?” Why is that your goal? What purpose does that serve in your estimation? What you describe is a manifestation of delusion, created in the minds of those who are susceptible to magical ideas. The end result is that they “believe harder” and I contend this is a negative, not a positive, because it entrenches them even more deeply into delusion and denial, and perpetuates the deification of falsehood, and the dismissal of truth. As a skeptic, I don’t accept as fact things unproven–that much is true. That doesn’t mean I don’t believe in anything. I believe in quite a few things. Like education, honesty, self-awareness, truth, self-responsibility, friendship, love, learning, ethics, separation of church and state, etc….These beliefs don’t affect my ability to recognize facts and truth. And they do not reportedly determine the fate of my soul, or exist under threat of suffering if i don’t choose to embrace them. They are concepts that inform the quality of my daily life and my interactions with others. I have imposed a subjective value on these things, for those reasons. This is nothing like the tenets of faith and belief in supernatural, as these ideas are attached to the concepts of guilt, fear, suffering and death, springing, as they did, from monotheistic belief systems. So it follows that supernatural belief systems are insidious in their ability to usurp the thinking mind, and instead draw on the primitive reactions of the amygdala, where reason cannot get a foothold. So when you say you are a skeptic, CMorte, I have to point out that the data seems to indicate otherwise. You say you “don’t believe in anything”–but that’s not any truer for you than it is for me, as I pointed out above. This statement is contradicted by the things you write. And you are even writing a monstrous book about guiding people on “the other side”!! That implicitly states a belief in souls, afterlife, and all things supernatural (it also assumes facts not in evidence, which is YOUR BELIEF in something). When you speak of demons and goddesses and anything else supernatural, and you frame it in a context of having experienced phenomena like this, then you BELIEVE IT. The fact that you have labeled these things, means you think you know what the experiences actually were, and thus, they are real to you. This, while admitting to drug use during at least some of those experiences. It’s easy to see why you would count those experiences as “real”–you were under the influence of something as strong as your own wishes and needs, namely, a drug. this would be a true statement because I know that UFO is an abbreviation for Unidentified Flying Object, and yes, there have been instances when an object was flying and it could not be identified. That doesn’t mean I believe that they are spaceships, piloted by extraterrestrials. And it doesn’t speak to my opinion on whether or not that might be possible. These are more examples of logical fallacy, and the variables inside these arguments are the catalyst for misunderstanding. Thus, you must understand what you are saying, and you must use the same dictionary everyone else has agreed to use. That’s what a standardized dictionary is for. takeovers of our secular government; unfounded beliefs cause someone in power to put their finger on a red button that will annihilate life as we know it. Damn right I get intense. I have a right to live, and THEY don’t have the right to take it from me. Now you might think you are not in this category, but I contend you are only a step away, because all it takes is the willingness to accept ideas without proof, which you have already demonstrated repeatedly. So I’m sorry if my intensity offends you. But I’m pretty weary of biting my lip about it. As Frantz Fanon said, “There comes a time when silence becomes dishonesty.” I have no desire to be guilty of either.You said, “i am not trying to be offensive. i am not trying to argue.” This is the way spiritual people weasel out of the fray. They deny any malice, and say they don’t want to argue. The reason is, if they engage in a rational argument, their beliefs and postulates will be shown false and even sometimes absurd, and this is not something they are open to. Now, I have been accused of being single-minded in my recent full conversion to atheism. And further, been accused of hypocrisy on some level, because I cannot be persuaded to believe again. But the point to be had here, is that I WAS A BELIEVER. I said all those same things, clung to all those same ideas, and defended them to others, just as believers do now to me. So I have been on the “other side” in that regard (pun intended) and made a logical decision to deny its veracity, based on the development of my intelligence, and the evidence and clarity of thought and reason. So implications of my stubborn single-mindedness are unfounded. I came to conclusions based on facts, and now honor my conclusions, since there have been no other facts or evidence to change them. So, if you speak casually, in a friend-kind-of-way, this excludes the necessity for truth? or rational thinking? or clarity of belief? If you are merely ruminating innocently, why work so hard on a book that is quite copious and detailed regarding supernatural forces and conditions in a plane of existence no one has proof for, and even you yourself haven’t experienced in reality? I think what you are really doing is back-peddling in the face of a rational argument. You mention “evidence” so glibly, it’s clear you don’t understand the meaning of the word as I mean it, which is as science sees it. When I speak of evidence, I refer to empirical, not anecdotal. I refer to the use of scientific method with falsifiability and double-blind procedures at play; not a photograph that “seems” to indicate something magical or out of the ordinary. You mention the “Frequency of chakras”–yet, again, you use another unprovable item to prove your other unprovable item. Chakras are an IDEA that became a cultural meme, but have no basis in fact. Adherents imbue the idea with some supposed authority beyond the realm of science, but this also places it beyond the realm of fact and thus, of truth. But try to get a believer to understand this, and you’ll be at it for eons. The irony with this sort of thought-paradigm is that if you don’t know how to think things through properly and logically, you are unaware that you don’t know how to think things through properly and logically. That’s why the arguments go on between the rational and the irrational–between atheists and spiritual/religious individuals. The problem can only be solved by educating as many people as possible in the skills of rational thought. Tautology, or circular reasoning (A=B because A=B). Inconsistency –Applying criteria or rules to one belief, claim, argument, or position but not to others). Confusing association with causation, (similar to post-hoc, except it’s when two things happen in proximity of time or location, and are assumed to be related). Understand that in all the 200,000 years that humans have been on the earth, not once has there been empirical evidence of supernatural claims. Never. Not even enough to serve in a court of law under the “beyond a reasonable doubt” edict. This fact must give us pause. If something were indeed true, in all those millennia, wouldn’t we have some shred of proof for it? “Essentially, what I’m suggesting is that humans are innately “hard-wired” to perceive a spiritual reality. We are “hard-wired” to believe in forces that transcend the limitations of this, our physical reality. 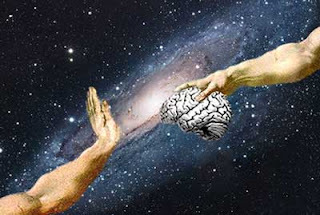 Most controversial of all, if what I’m suggesting is true, it would imply that God is not necessarily something that exists “out there,” beyond and independent of us, but rather as the product of an inherited perception, the manifestation of an evolutionary adaptation that exists within the human brain. And why would our species have evolved such a seemingly abstract trait? -In order to enable us to deal with our species’ unique and otherwise debilitating awareness of death. With the dawn of human intelligence, for the first time in the history of terrestrial life, an organism could point its powers of perception back upon its own being; it could recognize its own self as an object. For the first time, when an animal kneeled down to drink from the watering hole, it recognized its own reflection. Only humans possess the advanced capacity for self-awareness. Though, in many ways, this capacity has helped to make our species the most versatile and powerful creature on earth, it also represents the source of our greatest affliction. This is because once we became aware of the fact that we exist, we became equally aware of not just the possibility that one day we might not, but the certainty that one day we will not. With the advent of our species, with the emergence of self-conscious awareness, a life form became cognizant of the fact that it is going to die. All we had to do was to look around us to see that death was inevitable and inescapable. More terrifying yet, death could befall us at anytime. Any moment can be our last. All life is “hard-wired” to avoid those things that represent a threat to its existence. When an animal gets too close to fire, for example, it reflexively pulls away. It is this negative stimulus, this experience we call pain, that prompts all forms of life to avoid such potential life threats. Pain, therefore, acts as nature’s electric prod that incites us to avoid those things which may jeopardize our existence. In the “higher” animals, most particularly among the mammals, threatening circumstances elicit a particular type of pain we refer to as anxiety. Anxiety constitutes a type of pain meant to prompt these “higher” order animals to avoid potentially hazardous circumstances. For example, a rabbit is cornered by a mountain lion. In such a situation, the rabbit is pumped with adrenaline, charged with the painful symptoms of anxiety, all meant to incite the rabbit to most effectively escape from the source of its discomfort, in this case the mountain lion. In its healthiest form, anxiety is meant to prompt an animal to avoid or escape a potentially hazardous experience. In humans, however, once we became aware of the fact that death was not only inescapable but that it could come at any moment, we were left in a state of constant mortal peril, a state of unceasing anxiety – much like rabbits perpetually cornered by a mountain lion from which there is no escape. With the emergence of self-awareness, humans became the dysfunctional animal, rendered helpless by an inherent and unceasing anxiety disorder. Unless nature could somehow relieve us of this debilitating awareness of death, it’s possible our species might have soon become extinct. It was suddenly critical that our animal be modified in some way that would allow us to maintain self-conscious awareness, while enabling us to deal with our unique awareness of our own mortalities, of death. And that is a compelling argument about why people believe in the supernatural, and why logic and reason seem so out of reach for those who desperately need something outside of themselves to give them courage or purpose or hope. It is my fervent desire, to see the swelling of ranks in those who find these things inside themselves, instead. "Writers should not have romantic relationships with other writers. What they need instead, is to be involved with a character."